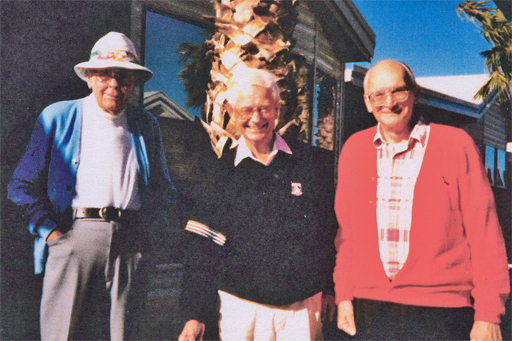 This photo was taken in 1997 in Tucson, Arizona. The middle man in the photo is me [Richard Farrar]. The man on the left is Ward Carter Suttle. He was the very first man in the Talos program at the Bendix Corporation in South Bend, Indiana. The third man is Bill Eiszner. Bill was first in his class at the University of Illinois and Mr. Suttle always bragged about getting Bill to come to Bendix. Bill joined the program while we were still at the South Bend plant and was one of the high-powered engineers. 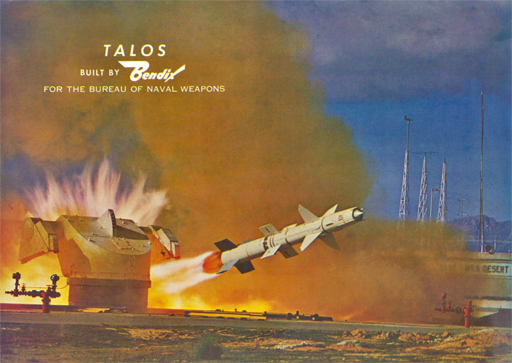 I left the Mishawaka Talos operation in January 1970, so I have no history on Talos being targeted against ground targets or being used as targets for other advanced missile programs. I did stay with Bendix for five more years in Denver, Colorado - as a part of the Bendix Navigation and Control Division of Teterboro, New Jersey, working with Martin Marietta and NASA on Sky Lab I, the first orbiting space station. I suspect that very little if anything was changed to the mechanical side of Talos (fuel control, engine, airframe, etc.) after I left, and that my group dwindled to a few people to provide support, check out, and assurance that the missile was OK for launch. In 1945, Johns Hopkins University Applied Physics Laboratory (APL) asked Bendix to come up with a fuel control system for the Bumblebee Program. Bendix made almost all of the fuel control systems for aircraft engines during WWII, so Bendix was the natural place to go for help fuel control-wise. Bendix got a big growth out of WWII, and the corporation had something like 50,000 employees when I was there - plus many divisions around the USA. Mr. Suttle was picked to lead the ram jet engine development program. He hired me in 1945 and at that time there were probably 20 people total in his group. I think it was called Department 836. Mr. Suttle remained in command from 1945 through the move from South Bend, Indiana, Bendix complex to Mishawaka, Indiana, in March 1951. He was in charge for several years at Mishawaka and then as the program grew to a major production facility for the Talos missile, Mr. Suttle moved back to the South Bend plant. Mr. Suttle and Dr. Goss of APL were great friends. 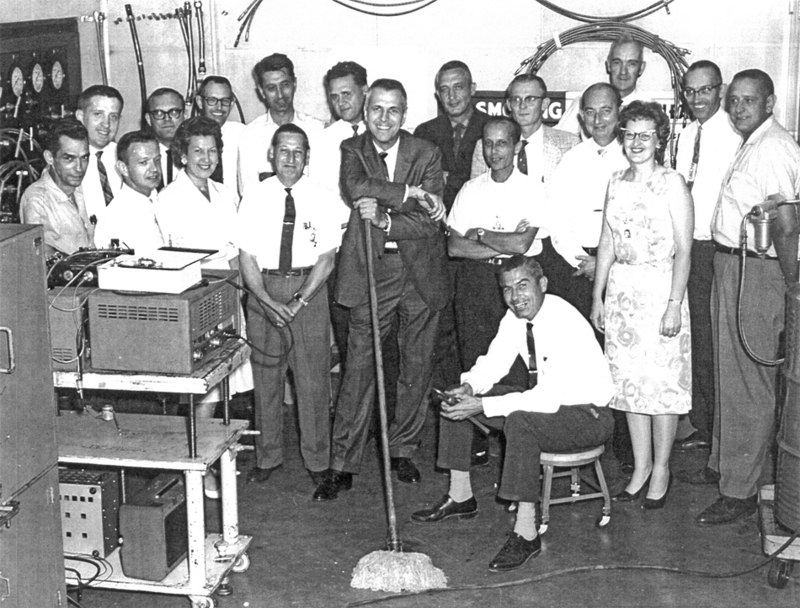 Dr. Wilbur Goss was Director of the Talos missile program at the Applied Physics Laboratory. We at Bendix thought Dr. Goss was "God" and the father of Talos. APL and Bendix were very close. APL was located in Silver Spring, Maryland. The B&O (Baltimore and Ohio) railroad ran from Chicago to Washington, DC, and had a schedule stop in Silver Spring. This railroad crossed Indiana and the north/south highway US 31 at a point directly south of the South Bend/Mishawaka area at a little town of LaPaz, just 13 miles south of the Bendix plants. At a little "one horse" station at LaPaz the passenger train could be flagged down to pick up a passenger or drop off a passenger. The train carried a car or two of Pullmans with individual compartments and a parlor car with a bar and lounge area. The schedule was good; 6:00 PM at LaPaz and 7:30 AM at Silver Spring. Going back it was about 6:00 or so at Silver Spring and flagged down at LaPaz at about 7:00 AM. So this was really a convenient way to get from the Bendix plant to Silver Spring and APL. The Silver Spring station was only about a four block walk from the APL building. A lot of fellows flew but that was a little more complicated; Bendix field to Chicago, Chicago to Washington National, cab ride, hotel, or car and a drive to Silver Spring. Anyway some APL and Bendix people liked the overnight B&O train. Dr. Goss came out to Bendix on the train and the Bendix car was to meet him at LaPaz in the morning. The LaPaz stop was very short and the porter, who knew you were to be ready to quickly depart at LaPaz, would wake you up about 50 miles before LaPaz so you could be dressed and ready to get off. Dr. Goss did not like the idea of getting up maybe 45 minutes or so before LaPaz, and he chose to go back for a few more minutes of snooze. The upshot is he was still asleep when they stopped at LaPaz. He tried his very best to use his authority to get the train to wait there until he got dressed, but on the train went to Chicago with him aboard. The Bendix driver who was waiting for him thought Dr. Goss had canceled his trip or was coming by plane. Later in the morning Bendix got a call from Chicago and sent a car for him. So we all had a good laugh. My other Dr. Goss story goes back to the early Talos days when we were still in South Bend - probably 1947. Carter Suttle invited Dr. Goss to speak to the St. Joseph County Engineers Club at a dinner in South Bend. Dr. Goss did give a good talk about the ram jet and the super-sonic speed, and all the difficulties, and, that a program like ours would last for about 25 years. At that time I thought, "wow" this will get me almost to retirement. At that time the "sound barrier" was thought to apply and humans could not go that fast. The audience asked Dr. Goss if he thought that humans could ever go faster than sound. He said no. If you ever had an "engine flame-out" all aboard would be killed. The human body cannot stand the deceleration Gs produced by the drag. I guess you should never say "never." I doubt if he ever remembered he said that. The Bendix group had a good start on the guidance and electrical side of Talos early on while still at the South Bend plant before moving over to Mishawaka in March 1951. Gene Halpin was the head man in that activity and he entered the group about the same time I did. He was about 8 years older than me. He and I were fraternity brothers from Purdue University in Indiana - although we didn't know that for a while. I thought that connection was a plus, career wise, but no such thing. He was a good guy and we liked each other - but business was business and if I amounted to anything, I was going to have to do it on my own. I hated to see him leave Bendix and we never saw or communicated with each other after that. Ed Crosby was a principal man in the Talos electrical side of the house - Guidance, etc. He was high in the "pecking order" and had the No. 2 parking spot right at the plant front gate - this was around 1960. He was very serious and detailed. His wife and kids were very good friends of my wife and kids. Anyway, he had a Porsche sport car that he was very proud of, and it was the only car of that high caliber at the plant. A group of the blows from the "mechanical side of the house" decided to "stick it to Ed." I knew about the plan but was not involved. One late afternoon a group of fellows lifted up the back of the Porsche and blocked it up so the rear wheels were about 1 inch off the ground - not noticeable at all. Then they waited at the gate until Ed came out, got in the car, started the engine, shifted to reverse to back out of the parking spot - and nothing happened. He shifted back and forth several times with nothing happening. Finally he got out and started examining the car and then he noticed the gang at the plant gate "whooping it up". He didn't take the joke well at all and insisted that they had ruined the transmission. Thinking of other interesting people in our Talos group, we had a lot of WWII veterans with unusual stories. I suspect anybody that survived WWII had an unusual story or two. One in particular I think worth mentioning is Jack Holloway. Jack was a P-51 Mustang fighter pilot. Had 61 missions and was shot down a few days after D-day. He parachuted east of Paris behind German Lines and was rescued by the French underground. They guided him through the Paris sewer system and lead him to the coastal "D" Day area. He was picked up by a U.S. tank group, got back to the coast and eventually to his air group in England. There they did not believe who he said he was. There had been German look-alike spies, and he was suspected. Anyway, luckily, his commanding officer had trained with him in the U.S. He and his wife had played bridge with Jack and his wife, so with some exchange of some detail events in bridge games Jack was accepted as the real McCoy. He was sent back to the states, because, it was said the Germans would treat him drastically if he was captured. This photo is the hydraulic section that handled all hydraulics in Talos, right up to the MOOG valve which was the interface with the electrical side of the house. The leader of that section was Kenny Waite, (leaning on the mop). He was captain of a B-17 in the European Theater. He completed several missions, and then on takeoff they had engine failure and crashed. The plane caught fire and no one got out except him. He was badly burned. I never knew this story for a long time. I always noticed he had a sort of crooked smile which I thought was part of his personality. But later someone told me it was scar from burns. We had a number of other WWII vets in the mechanical side of Talos. One of the top three men in the Missile Systems Division at Mishawaka was Pemerton Field, a survivor of the USS Arizona at Pearl Harbor.